Co. Kerry: Cahir (3), Drummod (2), Glenbeigh (2), Glencar (2), Killemanagh (2), Killorglin (2), Killynaan (2), Prior (2), Valentia (2). The Board also included 6 ex-officio Guardians, making a total of 25. The Guardians met on alternate Wednesdays. The population falling within the Union at the 1831 census had been 26,785 with divisions ranging in size from Glencar (population 1,246) to Cahir (5,653). The new Cahirciveen Union's workhouse or "Sanctuary to the Destitute" was an enlargement of an existing building — a lodge at Bahaghs, around three miles to the east of Cahirciveen, then owned by the local McCarthy family from Sugrena. It was planned to accommodate up to 800 inmates. The conversion work began in 1842 and took over three years to complete, during which time a number of other buildings in the area were used as auxiliary workhouses. The cost of the building work was £7,500 plus £1,350 for fixtures and fittings etc. The workhouse was declared fit for the admission of paupers on 19th August 1844 although did not admit its first inmates until the 17th October 1846 because of delays in setting a poor law rate through which the workhouse's operation would be financed. The building was roofed with slate from the quarry twenty miles away on Valentia Island, and large granite slabs were used as corner stones. The men employed on the building worked from 6am to 6pm for wages of 9d. a day. At noon, their wives arrived on foot from up to thirteen miles away with cans of milk and home-made oatmeal bread. Part of the funding for the workhouse was organized by the Cahirciveen Relief Committee which raised £280, which included £100 from Daniel O'Connell MP and £30 from the Indian Relief Fund. The workhouse site occupied over seven acres, with a perimeter wall thirteen feet high. An entrance block lay at the east of the site. The main building was three storeys high and accommodation is said to have included a hospital and fever ward on the top floor, staff rooms on the middle floor, and inmates' quarters on the ground floor. There was also a school, chapel, wash-house, and a soup kitchen. The location and original layout of the workhouse are shown on the 1842 map below. 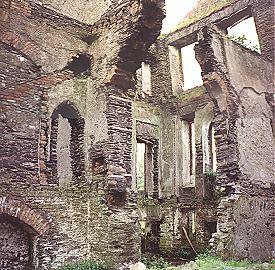 Cahirciveen workhouse, main block from the south-west, 1999. 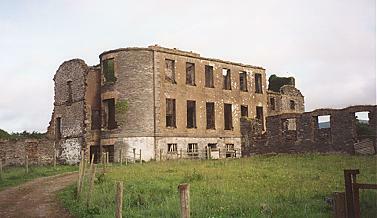 Cahirciveen workhouse from the north-west, 1999. 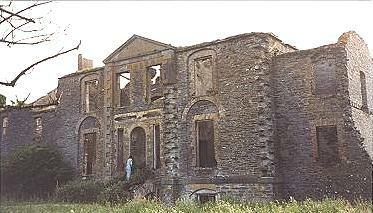 The workhouse came under great pressure during the famine years of 1846-48 and extra accommodation was hastily erected. However, as in many other parts of Ireland, the death-toll from the famine was high. Most of the inmates who died in the famine were buried in mass unmarked graves in Sugrena churchyard which now contains a monument to their memory. Beef heads — 40 lbs. Loaf sugar — 112 lbs. Soft sugar — 112 lbs. By the end of the century, a number of additions had been made to the site, including a fever hospital at the west of the workhouse, as shown on the 1895 map below. At the 1901 census, the population of the Union was 22,435. 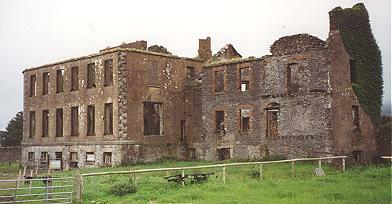 The workhouse fell into disuse in 1921 when its remaining inmates were transferred by cart to Killarney. The building was sold in 1923 to Charles Keating. Stone from the building and slate from the roof were used for other local buildings. The former Cahirciveen workhouse is now a derelict shell. Kerry County Library, Moyderwell, Tralee, Co. Kerry. Holdings include Board of Guardians' minutes (1905-22).